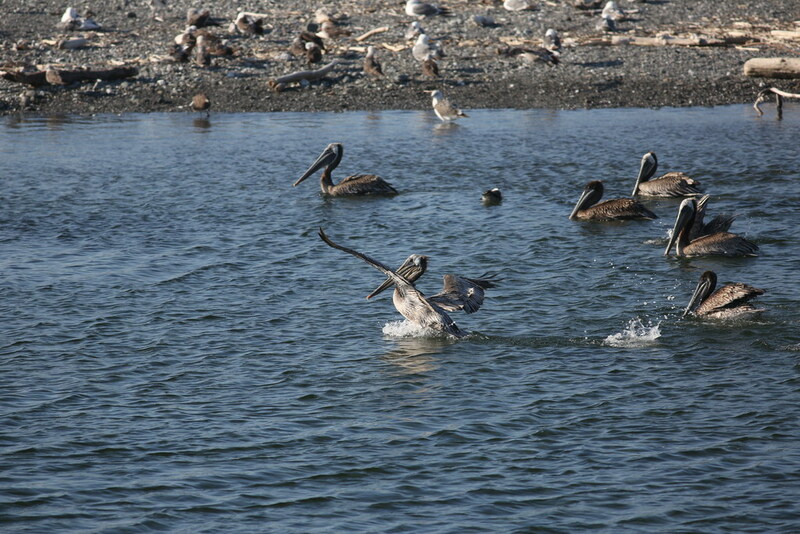 Pelicans are my second favorite birds, just behind ospreys. Unlike ospreys, which I like to photograph because of the way they dive into the drink feet first and pull fish out with their talons, pelicans dive in head first but, when they surface, you don’t see their catch. 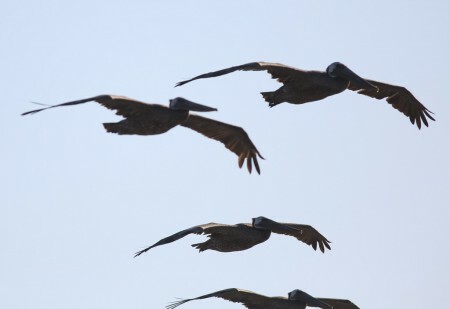 However, if you watch closely, you may see them throw their heads back and observe a little lump move along the pouch that makes up the lower part of their bills. That’s the fish being swallowed. 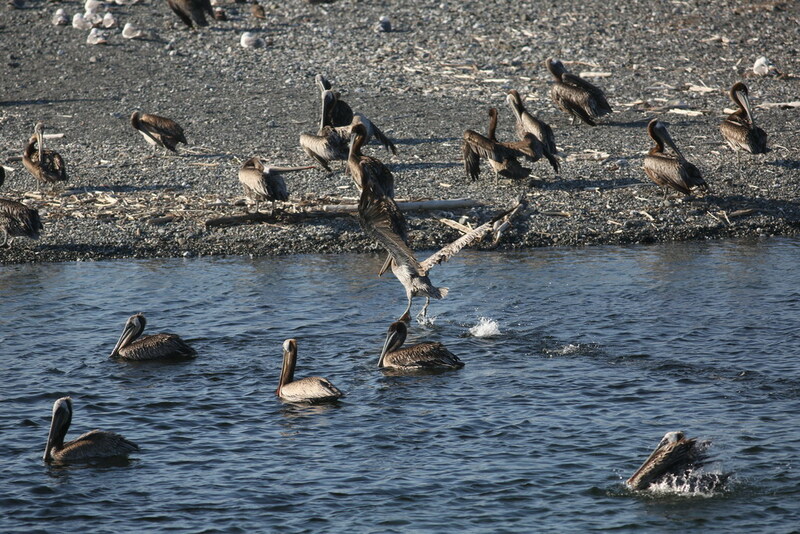 A week or so ago, I discovered something else about pelicans. 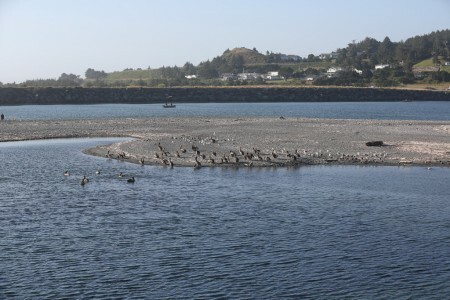 I was on the south jetty at the mouth of the Rogue River, here in Gold Beach, Oregon, and I saw pelicans doing something I’d never seen them doing before. What I observed is explained in the cations to the photos. All but the last photo were taken with my Canon 5D Mark III and either my EF 400mm f/5.6 L USM lens or my EF70-200mm f/2.8L IS II USM lens. (You can figure out which lens I used by looking at the focal lengths beneath the photos.) 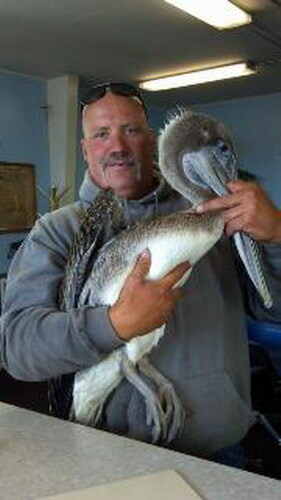 In the last photo is my friend, Earl Yager, holding a pelican. That photo was taken with a cell phone. 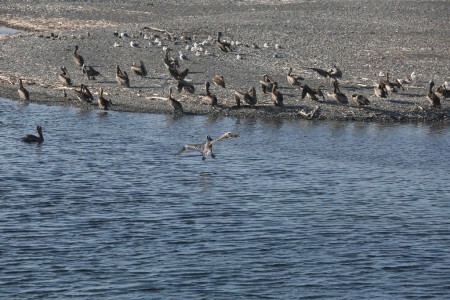 I was on the south jetty of the Rogue River, and saw scores of pelicans flying parallel to the jetty as they flew into the river’s mouth. 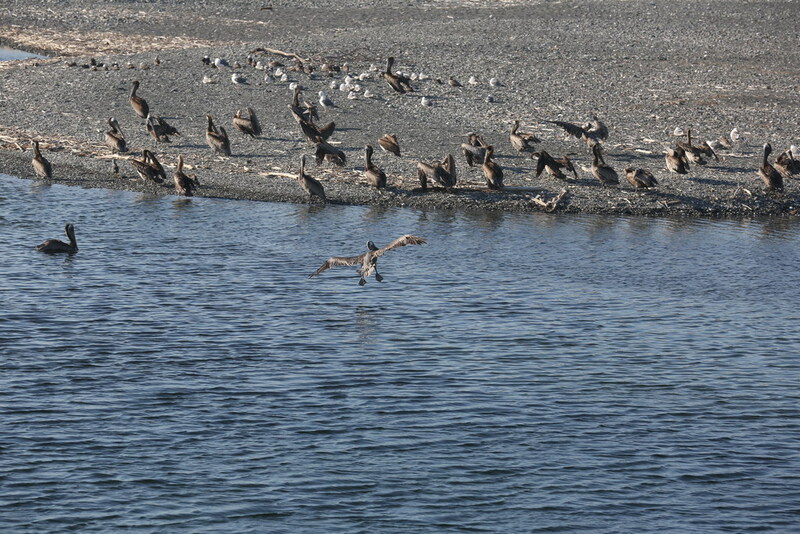 The pelicans were heading for a small pool that has formed in the middle middle of the spit of sand and gravel that is all but strangling the mouth of the Rogue. Scores more of pelicans were either already in that pool or on the spit. The pool itself is filled and drained by the changes in the tide as sea water seeps through the sand and gravel. 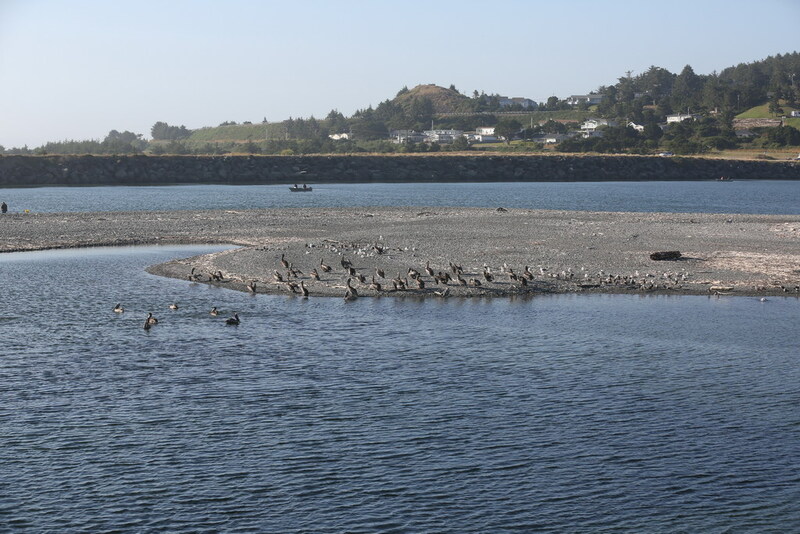 The tide was high and the arriving pelicans headed straight for that little pool, as the pelican in the center is, before going to the spit itself. 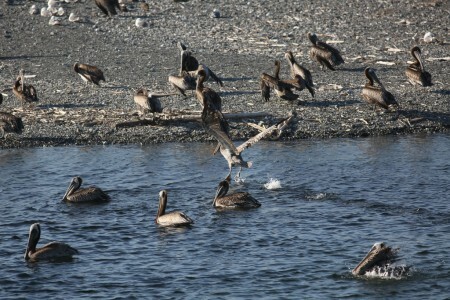 The pelican in the center of this photo is also a new arrival. 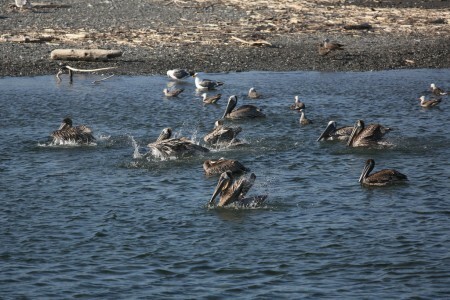 Before heading for the spit, each of the pelicans bathed and splashed in the pool. Twenty or more at a time were busy splashing around while the pelicans that had already visited the pool were resting on the spit. I suspected those splashing in the pool, they were washing away mites and other parasites, but I had no other evidence to support that hypothesis. 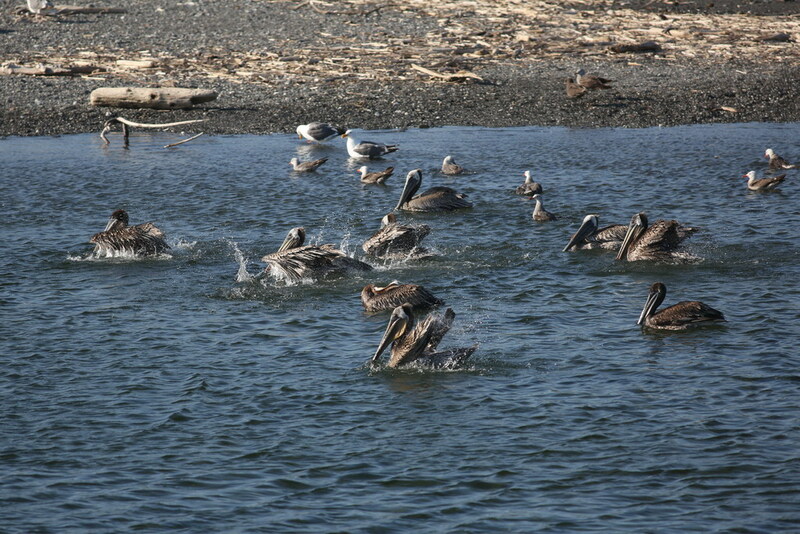 I watched as each bird “bathed” then took the short flight to the spit to join the others, as the pelican at the center of this photo is doing. This is my friend, Earl Yager. He works for the Port of Gold Beach. He had rescued the pelican he’s holding, after it had landed between a shed and a fence near the port’s offices. Because of the limited space the bird had landed in, it was impossible for it to spread its wings far enough to take off, again. That’s when Earl stepped in. The photo was taken by his boss, Port Manager Debbie Collins, just before he released the bird. 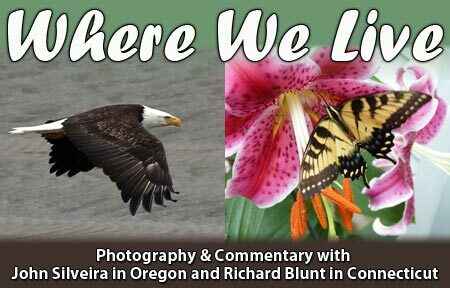 What I found interesting is that Earl said that, a while after he’d let the bird go, he looked down and his jacket was covered with thousands of mites. It was enough evidence, for me, to confirm my suspicions that the birds were washing away as many mites as possible while they were splashing around in the water of the pool.